If you think you've got a bad boss, one who loves to chew people out, or if you work with backstabbing co-workers, be thankful you are not a wasp. If you were, chances are your nestmates might bite you to communicate that it is time to leave the nest and forage for the colony, according to research by a University of Washington animal behaviorist. Biting is a way that workers in a colony of the social wasp Polybia occidentalis recruit new foragers to gather water, food and building material in a time of need, said Sean O'Donnell, a UW associate professor of psychology. O'Donnell previously found that biting appears to be an important way of regulating the division of labor among these insects. Now, in the current issue of the journal Animal Behaviour, he describes an experiment in which he artificially removed active foragers from four wasp colonies to see how new foragers are recruited. He found that biting was directed at certain individuals, who previously hadn't left the nest, to induce them to begin foraging. The rate of being bitten increased by an average of 600 percent for these recruited foragers, while biting rates did not increase for other workers. "The fact that biting was specifically directed at recruited foragers shows that biting is the mechanism that the colonies used to activate new foragers," said O'Donnell. "With no water, food and building material coming in to the nest, the colonies needed to ramp up their foraging workforce. This study shows that these biting interactions play a central role in recruiting foragers and that biting has a role in communication that affects task performance in a colony." 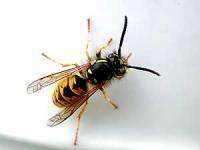 To study the wasps, O'Donnell first collected and anesthetized an average of about 300 workers from each of the colonies. He then marked each wasp's thorax with a color-coded system that made it possible to identify individuals and returned the insects to their nests. A day later, all foragers returning to a nest were removed for at least two hours and until none arrived for at least one hour of continuous monitoring. "The rate of foraging slowed down and stopped completely, placing stress on the colony because materials the colony needs, primarily food, are not coming in. So the colony needs to recruit new workers to make up for the loss," O'Donnell explained. On the final day observers watched each colony, noted the behavior of the marked individuals to see which insects were foragers, and recorded all biting interactions. O'Donnell said the biting did not always provoke an individual to begin foraging immediately, noting the biting seems to have a cumulative effect. Some insects were bitten multiple times for hours before leaving the nest to forage. "Going off the nest to forage, where they are exposed to all kinds of stresses and dangers, is probably the biggest change these animals face in their lives," he said. O'Donnell plans future studies to learn what determines which members of a colony are doing the biting and which are being bitten. He suspects that biting recipients are recognized based on something chemical on their body surface, as well as by an age component. O'Donnell and other scientists study social insects looking for clues about how social behavior evolved and how it is maintained since there are elements that are shared among all social animals. Social aggression is one such characteristic that is almost universal among animal groups ranging from insects to primates including humans.